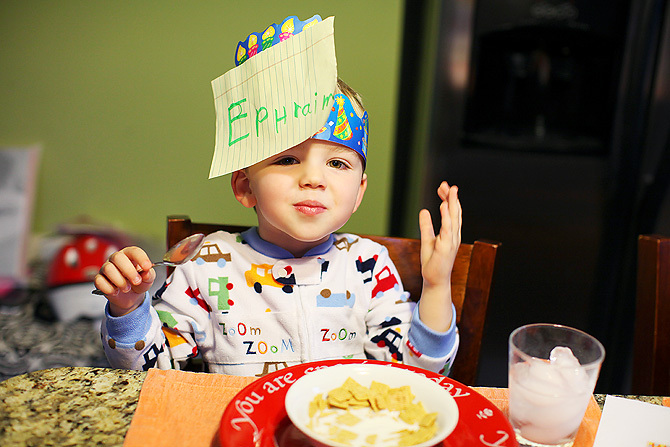 In his sister’s recycled birthday crown, new name tag created lovingly in those precious pre-dawn moments. To my boy on your fourth birthday: I hope that somewhere deep in your soul you will always know that there’s no greater gift to give or receive, than the gift of whole-hearted, sacrificial, everyday, abiding love. goosebumps! nothing better than sibling love! That is SO cute. I love how she made him that crown and nametag. As a big sister to a little brother – this one brought me to tears. Happy Birthday Ephraim! such a sweet story! i love that they like (and love) each other so much. you do’t see that everyday.